An Ideal Cream for Men U B Fair A Triple Action Remedy for Hyper Pigmentation that helps to reduce scars and marks, blemishes and post pimple marks for men. It also helps as a fairness cream suitable for all skin tones. Mr. P.S. Chhatwal Chief Initiator of torque Pharma reiterated the fact that there are many pharmaceutical companies in India, but very few drug manufacturers whose main focus is generics only. The lower margins for generic medicine manufacturers dissuade many, but at Torque Pharma, we take pride that our medicines are affordable and help people from the lowest economic strata of the society. With quality as the foundation of our venture, our products have made an enviable place for themselves in their respective market categories. Some of the leading products among these are Torex cough syrup, Ketomac shampoo, No Scars cream and Face wash, Foot Guard ointment, Hemoforte and Hemoplus iron tonic preparations to name a few. In our endeavour to continually improve at every level, we pride ourselves among the few Indian generic pharma companies that offer low cost drugs of international quality. 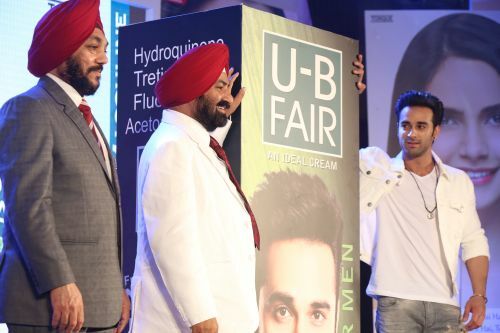 The evening saw the Mega launch of U B Fair with Brand Ambassador Film Actor Pulkit Samrat doing the honors in the presence of Legendry Actor Shri Om Puri , his son Ishan Puri and wife in attendance. The show was anchored by one of the most prolific host and master of ceremonies Sidharth Kannan who made it sure that everyone from the dealers of the company and corporate representatives to gentries from the Press & Media participated in the goings on and made the evening a very lively affair. Adding to the entertainment quotient were the dance items and musical and comic performance from one of the leading stand up performer Sugandha Mishra who saw to it that the programme ended on a musical note. This entry was posted in Trending News and tagged TORQUE U B FAIR launched with PULKIT SAMRAT as Brand Ambassador.